It is the beginning of district play for all districts in 8-Man football. We enter this Week 5 in Eight-Man, Division I with twelve unbeaten teams and nine others at 3-1. Not since 2011 have we had as many as 12 teams enter Week 5 unbeaten. There were 13 teams unbeaten at this time in 2011. Spearville, the dominating defending champions, have been ranked No. 2 all season behind St. Francis. The votes are essentially even, and the Royal Lancers have done nothing through four weeks that indicates they are beatable. St. Francis is talented and has averaged 47.5 points per game including that hard-fought season-opener over Sharon Springs-Wallace County (22-20). The Indians will have to deal with their rival Atwood-Rawlins County (4-0) in the battle for the Yoke in Week 6. While the districts on the west side certainly have their favorites on paper, the east side presents some challenges with eight of the 12 unbeaten teams. Districts 1 and 3 each have three teams without a loss entering Week 5. In District 1, Sedan and St. Paul have experienced teams that have paid their dues for a couple of years, while traditional contender West Elk will certainly be a factor. District 3 gets a lot of the attention in 8-Man, Division I, and rightfully so. Eight-Man newcomer Herington is off to a 4-0 start and will travel to unbeaten Clifton-Clyde on Friday in the Kpreps’ Fan’s Choice for Game of the Week. Burlingame is also unbeaten in this district and ranked third in the state. Meanwhile, Rural Vista (3-1) which was a part of the rankings for the first four weeks, fell out after a 74-72 double-overtime loss to Clifton-Clyde last week. District 4 includes fourth-ranked Osborne and unbeaten Logan-Palco. Sedan (4-0) – The Blue Devils have displayed an explosive offense thus far, scoring at least 44 points each game. Three Blue Devils – quarterback Alex Burger and running backs Jake Mills and Hunter Padgett – have rushed for more than 330 yards. The defense, which is led by Padgett with 35 tackles, has posted shutouts on the road against Central Burden and Udall. However, Sedan’s four wins came against teams with a combined 5-11 record. Sedan is off to its best start since it finished 8-1 in 2011. St. Paul (4-0) – Coach Keith Wiatrak is gradually molding the Indians program into a winner again. When he took over in 2014, St. Paul was coming off a 1-7 record. Since then, the Indians have gotten a little better each season, posting records of 3-6 and 6-3. Now, the former 8-Man power is off to its best start in years. The Indians have scored at least 46 points each game. West Elk (4-0) – Like Sedan and St. Paul, the Patriots have had no problem scoring points so far. West Elk scored as many as 68 points against Oxford and no fewer than 46 points, which came in a shutout of Central Burden. Senior Chase Vandegrift has rushed for 432 yards and eight touchdowns on 51 carries. Junior Cade Miller has 343 rushing yards and nine touchdowns on only 33 attempts. The Patriots hope to go on another playoff run after finishing 10-1 last year. Marmaton Valley (3-1) – The Wildcats’ season has been interesting to say the least. In all four of their games, there has been a shutout. Marmaton Valley was the benefactor in three of those games, posting lopsided victories over Chetopa, Colony-Crest and Altoona-Midway. However, the Wildcats also suffered a 54-0 loss at Greenfield, Mo. Madison (2-2) – A perennial power as recently as a few years ago with veteran coach Fred McClain at the helm, the Bulldogs are working their way back up the ladder with their third head coach in three years. Madison finished 2-7 last under Terry Flannigan and have matched that win total this year under the tutelage of Alex McMillian. The Bulldogs needed a 35-yard Hail Mary pass last week to top Wetmore 40-34. Southern Coffey Co. (1-3) – The Titans have been punchless for the most part this season, scoring a total of eight points in their three losses. Their lone win came 30-28 at home against Waverly in the second week. Coach Korey Lankton will try to lead the Titans back to the playoffs after they missed last season. Cedar Vale-Dexter (2-2) – The Spartans’ two losses were against undefeated teams in Sedan and West Elk. Coached by Richard Atherton and Dustin Murphy, the Spartans are coming off a 64-14 win over South Haven. Cedar Vale-Dexter is searching for a winning season after finishing 3-6 last year. Oxford (2-2) – Like the Spartans, the Wildcats’ only losses were to those SCBL unbeatens Sedan and West Elk. Oxford enters district after a 60-26 win at Stafford. Oxford, which finished 1-8 last season, ended a five-game losing streak by opening the season with a 54-6 win over South Haven. Peabody-Burns (1-3) – The Warriors have struggled to score this season, producing 12 points or fewer in each of their losses. David Pickens’ Warriors are in danger of suffering their first losing season since they were 4-5 in 2011. Udall (1-3) – The Eagles will try to bounce back in district competition after suffering a 50-0 loss to Sedan last week. Udall has a couple of strong running options in running back Dylan Loos (383 rushing yards) and quarterback Joshua Fielder (379 yds). The young Eagles team will try to avoid their first losing season since 2010. Central Burden (0-4) – The Raiders have not had a strong start to the season, scoring only 18 points in four games. It’s especially disappointing when you consider the Raiders were 8-3 just a season ago. Central Burden’s four opponents are a combined 15-1 so the schedule has been tough, but so has replacing all-stater Lucas McMichael. Flinthills (0-4) – Chuck Bisbee’s Mustangs are on a 19-game losing streak. Flinthills’ last victory came 42-8 at Elk Valley in September 2014. The Mustangs have been shut out in three of their four games this season. Herington (4-0, 2-0 district) – Herington won just 11 contests from 2005-15 before a 4-0 start in its first season of eight-man football this year. The Railers played without standout quarterback Tate Becker last week, but had standout performances from several players and averages 363 rushing yards a game. Senior Richard Hagerman has 71 carries for 473 yards and 13 scores. Senior Jonathan Lollar has 10 catches for 373 yards with six TDs along with six interceptions. Herington has forced 17 turnovers and had the No. 1 offense in the classification with 238 points. The Railers have averaged 8.4 yards per play. Clifton-Clyde (4-0, 2-0 district) – The Eagles have already exceeded their win total from the last two seasons that yielded 1-8 and 2-7 seasons. Clifton-Clyde defeated Rural Vista, 74-72, in double overtime last Friday. Caleb Charbonneau accounted for eight touchdowns in the win with five rushing and three passing. He has rushed for 691 yards with 13 rushing scores. Burlingame (4-0, 1-0 district) – Burlingame has passed for 129 yards and rushed for 241 yards a game. Junior Dalton Sporing has completed 33 of 59 passes for 514 yards with 12 scores against two interceptions. He has 33 rushes for 515 yards and 11 rushing TDs. The Bearcats have forced 12 turnovers and averaged 8.1 yards per play. Rural Vista (3-1, 1-1 district) – The Heat permitted just eight points in the first three weeks. Rural Vista led by 22 points midway through the fourth quarter at home against Clifton-Clyde before losing 74-72 in double overtime. The Heat play host to Herington and then travel to Burlingame in Week 8. Valley Falls (1-3, 0-1 district) – Valley Falls opened with a 24-14 victory at Wetmore in the season opener. After that, the Dragons have scored just 38 points and lost each game by at least 28 points. Centre-Lost Springs (1-3, 0-2 district) – The Cougars have already dropped district games at Herington (30-16) followed by a 60-14 loss versus Burlingame in Week 4. Their other loss came 18-12 against Goessel in a game called final at halftime due to severe weather. While Centre has a significant climb to get back into the district standings, the Cougars are an experienced team that could play the role of spoiler in this district. Onaga (1-3, 0-2 district) -- Like Herington, Onaga is in its first season of eight-man football, though has not had the same success. The Buffs have scored 118 points and allowed 174. Like Centre, Onaga has a big hurdle in district play after a 48-0 loss to Rural Vista in Week 3, and a 70-38 defeat versus Herington last week. Logan-Palco (4-0) – The Trojans are off to a 4-0 start for the second straight season and have won at least four games in all four seasons since Logan and Palco formed the football co-operative agreement. Logan hasn’t made the playoffs since 2002, Palco since2006. Junior running back David Thompson continues to deliver huge numbers. He has 94 carries for 874 yards with 17 scores. Senior quarterback Josh Van Laeys has accounted for eight scores. The Trojans have long road trips to Osborne and Solomon but get Victoria at home. 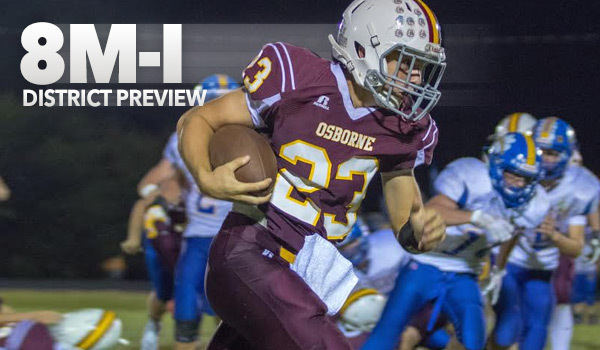 Osborne (4-0) – The Bulldogs have matched last season’s win total from a 4-5 season and held off Pike Valley, 34-32, in Week 4 at home. The Bulldogs, which allowed 37.6 points a contest last season, has an average score of 45-13. Senior Cullen Grabast and junior Denton Schurr have averaged 96 and 113 rushing yards a game, respectively, and combined for 16 rushing scores. Solomon (3-1) – Sophomore Braden Neilson has stepped for Jake Tiernan at quarterback and thrown for 616 yards with a 14/3 TD/INT ratio. He has also rushed for 123 yards and three scores. Junior Jake Harmon has 41 carries for 462 yards and seven rushing TDs. Solomon has forced eight fumbles but just recovered two, a low rate. Solomon is minus-5 in turnover margin. Victoria (2-2) – The Knights have reached the playoffs 14 straight seasons, the longest current run in eight-man football. Victoria, who returned zero offensive starters, has received a solid first month from junior quarterback Collin Kisner. The Knights lost two home games: 48-22 versus Central Plains and 46-36 against Otis-Bison in Weeks 1 and 4. Last week, Victoria had the lead in the fourth quarter. Bennington (1-3) – Bennington has struggled in its transition from 11-man to eight-man football and has allowed 182 points. The Bulldogs defeated Thunder Ridge, 54-14, last week for its first victory. Lincoln (1-3) – Lincoln opened with a 56-28 win against Tescott before three straight losses. In those games, the Leopards have permitted 48, 46 and 57 points. Central Plains (4-0) – The Oilers have posted a great start and risen to No. 5 in the rankings with Central Prairie League road wins against Victoria (2-2) and Otis-Bison (3-1) in the first three weeks. The Oilers, with a heavy non-senior squad, have been balanced with 144 passing and 187 rushing yards a contest. Sophomore Devin Ryan has quickly settled in at quarterback with 33 of 51 passing for 486 yards with an 8/1 TD/INT ratio. Sophomore Alex Hickel has 348 rushing yards and four scores. Junior Alex Barton has 21 catches with 385 yards and six receiving scores, along with 183 special teams and 167 interception yards and 47 tackles, all team highs. He has also led the team with five interceptions, two fumble recoveries with two pick-sixes and one punt return score. Goessel (3-1) – Goessel opened with a 38-24 victory against Wakefield, and an 18-12 win versus Centre-Lost Springs in a game that ended at halftime. The Bluebirds then fell 54-36 versus Solomon and blanked Peabody-Burns 48-0 last week. Goessel has already matched last season’s win total. Another victory would mark their most since a 6-4 season in 2012. St. John (2-2) – St. John has alternated wins and losses, including a 44-34 Week 2 home win against Kinsley, and a 76-32 road victory at Macksville. The first victory ended a 12-game losing streak and marked just the second win since Oct. 4, 2013. Ellinwood (1-3) – Ellinwood, which has not made the playoffs since 2004, opened with a 32-12 road win versus Kinsley before consecutive losses to Otis-Bison, Victoria and Ness City by 40, 38 and 10 points. Ellinwood has averaged just 2.9 yards per rush, but sophomore Myles Menges has completed 57 percent of his passes for 904 yards with a 10/1 TD/INT ratio. Little River (1-3) – Little River’s lone win came 44-12 at Bennington in Week 2. The Redskins opened the season with a six-point loss to Centre, and dropped a 48-36 decision to Wakefield. Last week, Little River was beaten 50-0 against Solomon. Senior Clay Zeller has 309 passing yards with a 5/2 TD/INT ratio with 173 rushing yards and three scores. Junior Peyton Harvey has 61 carries for 414 yards and two scores. Canton-Galva (0-4) – The Wheat State League hasn’t necessarily been a welcome host to Canton-Galva. The Eagles had one game with 42 points, a 26-8 road loss to Peabody-Burns in Week 3. Canton-Galva is 1-12 in the last two seasons. Argonia-Attica (3-1) – The Titans reached the Eight-Man, Division II title game the past two seasons and took heavy graduation losses. In Week 2, A&A lost to Caldwell, its first regular season defeat in 21 contests. In Week 4, the Titans defeated South Barber, 40-26, which was ranked No. 5 in Eight-Man, Division II at the time. The Titans have continued their prolific offense from the last several years, averaging 48 points per contest. Senior Seth Hemberger has led the offense with 467 rushing yards and 10 scores. He also has 189 special team yards. South Central (3-1) – South Central won its first three contests before a 66-26 loss versus Hodgeman County last Friday. Seniors Gerald Morehead and Kody Huck are two of eight-man’s top players. Morehead has 480 rushing and 123 passing yards with 13 TDs accounted for. Sophomore Cole Lohrding has also played quarterback for first-year coach Billy Nichols. Morehead has 46 stops while Huck has 24, though didn’t record a stop in the loss versus Hodgeman County. Fairfield (1-3) -- The Falcons ended its co-op with Cunningham after one season and picked up a 40-30 victory against Burrton in the first contest. Then, Fairfield has permitted 52, 56 and 64 points in three straight losses. Macksville (1-3) – Macksville defeated Kinsley, 40-22, in Week 3, just the third victory since the beginning of the 2013 season for the Mustangs. The other two wins came against St. John. Kiowa County (0-4) – Kiowa County has been competitive in most of its games with losses by 20, 16, 24 and eight points. The offense has tallied 24.5 points per contest, while the defense has permitted 41.5. Last season, the Mavericks went 5-5, including 4-1 in district play, and averaged 33.6 points per contest with 31 allowed. Pratt-Skyline (0-4) – The Thunderbirds’ closest two games came with a 36-12 loss to Hutchinson Central Christian in Week 2, and a 34-16 road defeat to Norwich last week. Skyline opened 0-4 last season, though went 3-2 in district play and missed the postseason by a game. Spearville (4-0) — The Lancers, the defending Eight-Man, Division I state champions, have won 17 straight games. Spearville has outscored opponents, 206-28, including a 38-6 Week 2 victory against Hodgeman County. The Lancers have averaged 325 rushing yards and 9.8 yards per carry. Senior Luke Heskamp has 42 carries for 483 yards and eight TDs. Ness City (3-1) — Ness City lost to undefeated Central Plains, 54-8, in Week 2 with wins versus Macksville (76-26), St. John (46-28) and Ellinwood (44-34). Last season, its first under current coach Marc Cowles, the Eagles opened 2-0 with wins versus Kinsley and Macksville before a 1-6 finish. Satanta (3-1) — The Indians went 6-4 and 7-3 the last two seasons and have opened 3-1 before a 30-28 road loss to Moscow last week. Satanta has averaged 368 rushing yards a contest. Sophomore Gabriel Salas has 65 carries for 699 yards and 12 rushing scores. He has completed 10 of 21 passes for 130 yards with a 6/0 TD/INT ratio. Leoti-Wichita Co. (2-2) — The Indians have alternated losses and wins in their inagural eight-man year and with it snapped a string of four straight 1-win seasons. All four games have been decided by at least 46 points, including a 46-0 road win versus Moscow in Week 2, and a 52-6 home win versus Triplains-Brewster in Week 4. Kolton Sheppard leads the Indians with 437 rush yards and four scores, while quarterback Jorge Gallegos has six rushing touchdowns. South Gray (1-3) — The Rebels narrowly lost 24-20 to WaKeeney-Trego in Week 2 and then won, 54-6, versus Bucklin. South Gray is 2-11 in the last two years. The victory ended an eight-game losing streak. Kinsley (0-4) — Kinsley has a big loss versus Central Plains in Week 4, though lost its first three games by 20, 10 and 18 points. The Coyotes have lost seven straight games, but feature one of the classification’s top players in Humberto Soto. Key Games: (Wk 5) Leoti-Wichita Co. at Satanta; (Wk 8) Satanta at Ness City; (Wk 9) Ness City at Leoti-Wichita Co.
Atwood-Rawlins Co. (4-0, 2-0 district) – The Buffs have three victories by at least 34 points and defeated Wallace County, 26-20, in Week 2 in a signature win. Coach Matt Smith, in his first season, has led the Buffs to 267 rushing yards and 67 passing yards a contest. Senior Cole Sramek has 44 carries for 410 yards and six scores. Atwood has averaged eight yards a carry. In his career, Sramek has 3,375 rushing yards and 46 rushing scores. St. Francis (4-0, 2-0 district) - The Indians, ranked No. 1 in the classification all season, is 14-1 under second-year coach Rodney Yates. St. Francis has outscored opponents, 190-38, and ranks fifth the classification in scoring defense. Senior Quinton Cravens has completed 27 of 38 passes for 596 yards with an 8/2 TD/INT ratio. He has 258 rushing yards and nine rushing TDs. WaKeeney-Trego (3-1, 1-0 district) – The Golden Eagles opened 3-0 with three road wins and its best start since 1984. Last Friday, WaKeeney-Trego fell 50-0 at home to Sharon Springs-Wallace County. Trego has forced 13 turnovers, including four interceptions from junior Brendan Flax. The Golden Eagles have three non-offensive scores. Hill City (2-2, 1-1 district) - The Ringnecks have a Week 2 road victory versus Stockton (26-0) and a Week 4 home win against Quinter (54-0). Hill City has two losses by 48 points in each game. Senior Gabe Hamel has 61 carries for 380 yards and eight scores. Hoxie (2-2, 0-1 district) - Hoxie, with no seniors, averages 216 yards on the ground. Juniors Troyal Burris and Latham Schwarz lead the squad with 383 and 306 rushing yards and each has six rushing scores. The Indians have 12 turnovers and are minus-3 in turnover margin. The Indians lost, 46-12, at Atwood-Rawlins County last week. Oberlin-Decatur Comm. (0-4, 0-2 district) - Oberlin has scored 42 points this season and lost each game by at least 38 points. Oberlin has lost six straight and eight of its past nine games. Quinter (0-4, 0-2 district) – Quinter was shutout in each contest, except a 36-14 home loss versus Greeley County in Week 2. The Bulldogs have lost 16 straight contests.